Not long ago, A friend of mine asked which 4000 footer should he tackle as his first winter 4k peak. He already had his winter equipment figured out from local lower elevation hikes like Mount Monadnock. He is also a decently experienced “fair-weather hiker” looking to extend into the winter months. That’s a tough question to answer! So, I decided to write this article about it. I tried to approach this as a progressive 5 step program instead of just listing off the easiest 4000 footers. If I could do it all over how would I plan it? I’d Start off easy, and lead into the tougher stuff to round it out. It’s important to remember that this is purely my opinion! 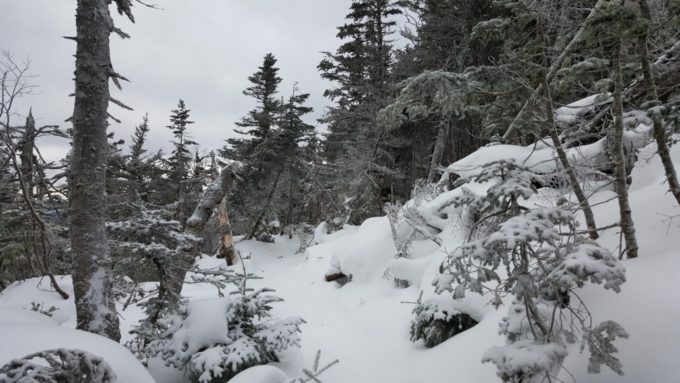 So here they are, the top 5 winter 4000 footers for beginners winter hikers. Looking through the trees on Waumbek. This one is a no brainer to me. Mt Waumbek is one of the easiest 4K’s in New Hampshire. The Starr King trail is super gradual and gentle on the knees. This trail brings you across the smaller Mount Starr King (3,907 ft). This is the perfect “first hike” as it will give you a chance to test out your layers and gear before getting into something more committing. 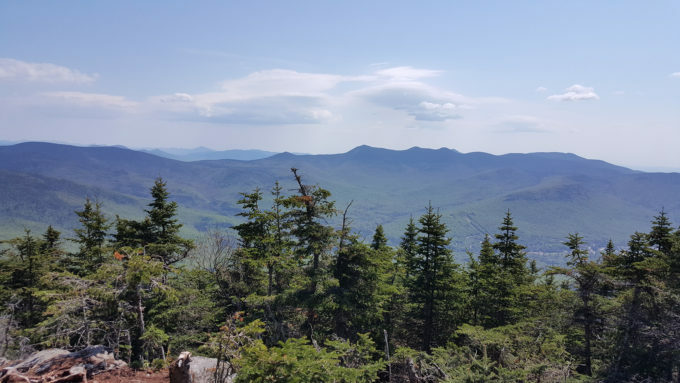 Views are limited on the summit of Mt Waumbek but if you walk about 1/4 mile past the true summit you’ll find a clearing that will give you a decent view of the Presidential Range! Mount Tecumseh is another one of the easier 4000 foot peaks in the White Mountains. 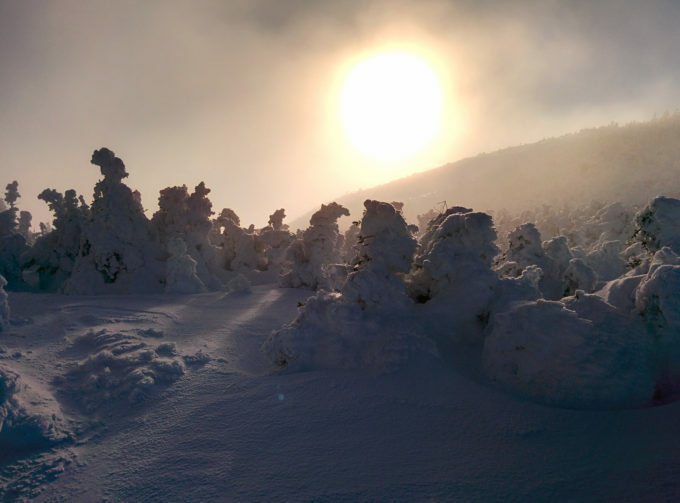 If you start at the Waterville Valley Ski area you can be back at your car within just a few hours. The once wooded summit of Tecumseh has been cleared illegally in recent years which has opened up a pretty amazing view. As a bonus, you can grab a beer and some food after your hike at the ski lodge! Mount Pierce is located in the Southern Presidential range. It neighbors Mt Jackson (4,052 ft) and Mt Eisenhower (4,780). The Crawford Path is the easiest route to the top. Starting at Route 302 in Crawford Notch This trail is very gradual and easy nearly all the way to the top. 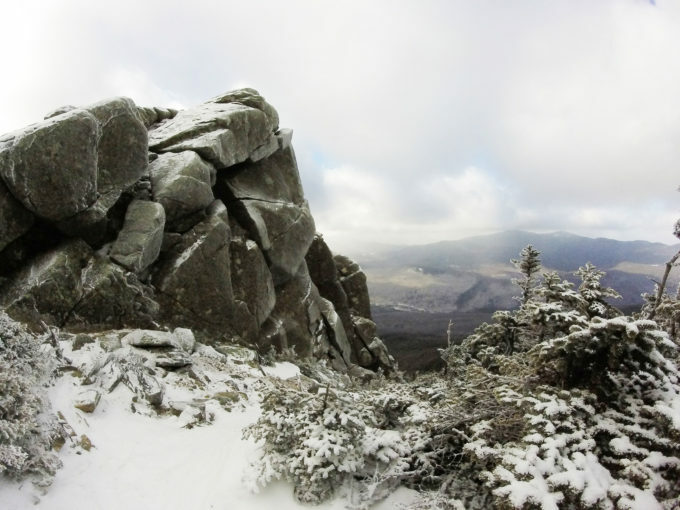 The summit of Mount Pierces offers amazing 360 degree views on patch of exposed rock. Looking north on a clear day you’ll be able to look along the southern Presidential Ridge to Mt. Washington. For such a short hike, this one is a winner! Mt Liberty is known for it’s exposed rocky pointy summit as seen from the highway below. The Liberty Springs trail offers a diverse mix of terrain and begins fairly gradual. It steepens up a bit near the top and can get icy in certain conditions. The summit offers amazing 360 degree views and a small glimpse at what being above treeline can feel like. If you’re feeling strong by the time you hit Liberty you may want to mozy over to it’s slightly smaller sibling to the south Mount Flume (4,327 feet) this peak will add 2.4 miles to your total trip and gain you another 4000+ foot peak! 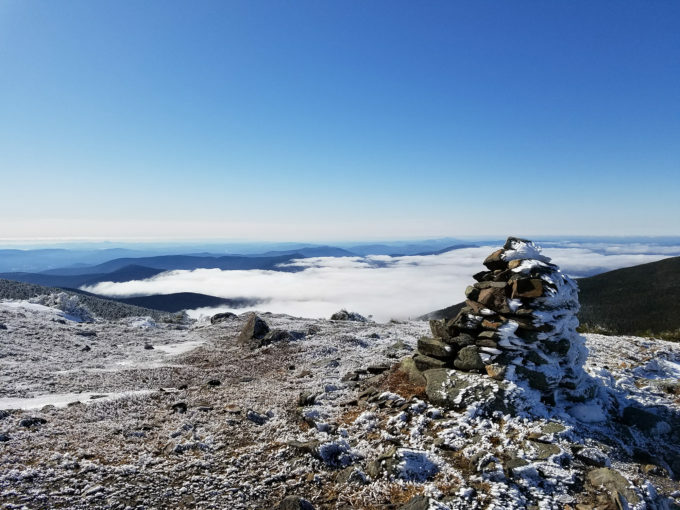 The western-most 4000 footer… Moosilauke! 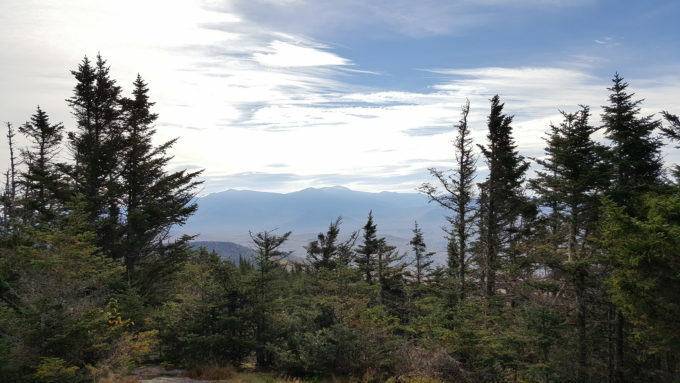 Commonly known as the “other above treeline peak” in the White Mountains. Moose has proven to be one of my favorite peaks in all seasons. In the winter it’s the perfect peak for new hikers looking to experience some above treeline conditions. The Glenncliff trail is very gentle with a few sections of steepness near the top. In some instances this trail can become extremely icy so you best have your traction devices! The beauty of Moosilauke is how abruptly you pop out of the trees to the exposed rocky path to the summit. On a windy day it’s like flipping a switch when you cross the threshold into above treeline territory. The above treeline stretch is only about a 1/2 mile and can be a thrill. Views at the top are some of the best! On a clear day you can see all the way to Vermont. On you’re descent, don’t forget to stop at the “south peak” which is not a true 4000 footer but is equally as beautiful as the main peak. So You Want to Ski In the Chic Chocs?